The rain had been coming down for days. By the early morning hours of November 6, 1977, an earthen dam near the North Georgia town of Toccoa couldn’t take it any longer and ruptured. The people at a tiny Bible College downstream were mostly asleep when the flood waters hit. Thirty-nine perished. Many were children. At the time, I was working for a local Atlanta television station. I had only been in the business a couple of years. Now, nearly forty years later, Toccoa remains the deadliest flood event I was ever involved in covering. Unless you ha d relatives there or were a journalist, Toccoa is one of those largely forgotten moments in history. But it is, and should be, a tragic reminder of how quickly inland flooding can change or even take your life. At Toccoa the people never had a chance. But in most flooding events, people who die didn’t have to. That’s right, they didn’t have to! How many times have you heard this: “Some of these people on the highway trying to drive through this stuff—they’re very stupid.” That was a quote to CNN from a Missouri flood victim this past December. It’s not as if the “stay out of the water” messaging isn’t out there. The “Turn Around Don’t Drown” program by the Federal Alliance for Safe Homes and the National Weather Service is exactly what it says. Don’t drive into that water! The yellow signs are in high risk, low lying areas around the country. Local meteorologists always get out that message to their audience whenever there’s a flood threat. Just last year major flooding events occurred in Texas, Oklahoma, Illinois, Ohio, South Carolina, Florida. If you know you are at risk, there are measures you can take to protect your home and property. The most import of which is to get a flood insurance policy. Consider elevating your air conditioning unit, water heater, and furnace. For more tips and information, go to the FLASH website. Sometimes there’s just no rhyme or reason. Bad weather “stuff” just happens. It’s fickle, unpredictable, weird, and strange. You can attach all sorts of adjectives to it. Back in 2008, Tropical Storm Fay set a record-making four landfalls in Florida. Unpredictable, weird, fickle, strange…you pick the adjective. As it meandered across the state, it just kept dumping water. In some places more than twenty inches fell. North of Melbourne the rain gauges swelled to a record twenty-seven inches. Tropical Storm Fay is a poster child for all those adjectives, and how it can happen anywhere. And the message is clear, bad weather “stuff” happens. Know your risk. Residents of Oso, Washington were traumatized on March 22 when a massive mudslide swept through the area engulfing homes and claiming lives. Months later, residents are still handling the aftermath of this tragedy as best as possible, but the financial burdens of rebuilding often become as traumatic as the disaster itself. Help could be on the way in the form of proposed federal legislation allowing homeowners and renters to set aside up to $5,000 every year in a disaster savings account – tax-free if the money is used for post-disaster repairs or pre-disaster mitigation. The money rolls over every year and there’s no limit to how much can be accumulated. If the Disaster Savings Accounts Act which is still wending its way through Congressional committees passes, homeowners and renters alike could establish accounts to use for future natural disasters. “Disaster Savings Accounts would provide people the opportunity to protect their belongings and families,” says U.S. Rep. Dennis Ross (R-Fla.), co-sponsor of the bill with U.S. Sen. Jim Inhofe (R-Okla.). Ahead of a disaster, the pre-tax savings can be used to pay for home fortifications such as a safe room, wind resistant windows and doors, or elevating structures in flood zones. After a disaster, savings can be used to help close the gap between insurance deductibles and other recovery funds. In that case, the event must be a state or federally declared disaster and the homeowner or renter must have uninsured losses totaling at least $3,000. “Insurance doesn’t cover all losses or cleanup expenses, particularly personal losses,” says former FEMA director James Lee Witt, Democratic candidate for the 4th Congressional District in Arkansas. For example, if the bill was in effect at the time of the mudslide, Oso residents with accounts could have used them to cover uninsured personal casualty losses above $3,000 because they are in a formal disaster area. Supporters for the bill come from all sectors, e.g. FLASH, The Home Depot, National Association of Home Builders, National Association of Insurance Commissioners, The Nature Conservancy and leaders like Moore, Oklahoma Mayor Glenn Lewis and former FEMA director James Lee Witt. The mudslide that impacted Snohomish County, WA this weekend has claimed at least 16 lives, destroyed homes, and countless others are still missing. With the potential threat of another mudslide affecting the area and spring showers around the corner, here are some lifesaving safety tips to protect your home and family from mudslides. Know your mudslide risk. Create a family disaster plan that includes a plan for evacuation and a 72-hour emergency kit. Heed evacuation warnings by officials. Know in advance who will give the official evacuation orders. The elderly, people with disabilities, those dependent on medical equipment or anyone else who would need help to evacuate should register with local officials in advance. Those with pets should identify pet-friendly options ahead of time. Mudflows are not covered by a standard home insurance; however they are covered by flood insurance. A mudflow is the movement of water and mud that flows across normally dry land. A mudslide or landslide, which can result from a collapsed hillside, happens when earth and rock travel downhill. Only mudflows, not mudslides or landslides, are covered by flood insurance. Click here for more information from the National Flood Insurance Program. Be aware of any sudden increase or decrease in water flow and notice whether the water changes from clear to muddy. These changes may mean there is debris flow activity upstream so be prepared to move quickly. Stay alert when conditions are ripe for mudslides especially when driving. Watch the road for collapsed pavement, mud, and other indications of a possible debris flow. Listen for sounds that indicate moving debris, such as trees cracking. After the mudslide, stay away from the affected areas and watch for flooding that can happen after a mudslide event. Sandbags to the rescue! 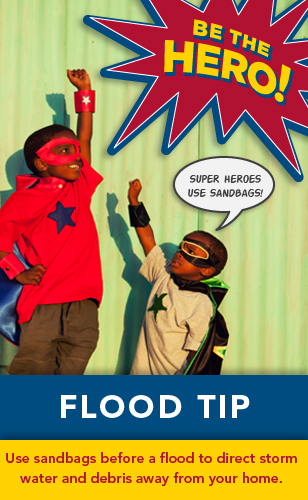 Use sandbags before a flood to direct storm water and debris away from your home. For more information on how to strengthen your home and safeguard your family from floods visit flash.org.